AUSTIN, Texas — Tom Luce, founder and chairman of Texas 2036, will keynote the Lumbermen’s Association of Texas’ (LAT) 133rd Convention & Expo in San Antonio, Texas on Thursday, April 18. Texas 2036 is an independent, nonpartisan, 501(c)(3) nonprofit organization. Its mission is to enable Texans to make fact-driven decisions through accessible data, long-term strategic policy planning, and statewide engagement to ensure Texans’ well-being and economic prosperity through its bicentennial and beyond. Luce was the founding and managing partner of the Hughes and Luce law firm. 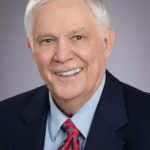 He was lead attorney on multibillion mergers and litigation and was selected at various points in his career as one of the best attorneys in Dallas, Texas and the U.S. He has a distinguished record of public service both at the state and national level, including his appointment as Assistant Secretary of Education by President George W. Bush.